Ground covers are useful for many different places. The important things are scale, vigor, and fertility of the soil. We advocate for plants that actually cover the ground in the most efficient way possible. Prepare the soil, at least double dig it so that there is oxygen in the soil. 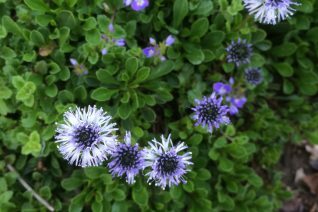 Smaller ground covers all uniformly require NON- compacted soil. And most benefit from an annual top dress of compost. Pour it right over the top and then water it to settle between the leaves. Water them reqularly unless they are completely drought adapted. For ground covers between pavers its important that the soil never becomes compacted- if it does (see above with compost). A good ground cover blocks out weeds and creates the effect of a pool of foliage. Don’t try to cover the whole planet- that is rarely successful. Here is a list of plants that do this job well. Low growing globe daisy that makes a great small scale evergreen ground cover. In mid-spring rising up from the small paddle shaped leaves spikes are topped with spheres of fluffy steel blue flowers. Spreads moderately fast on well drained sites with light summer water. Full sun to part shade. 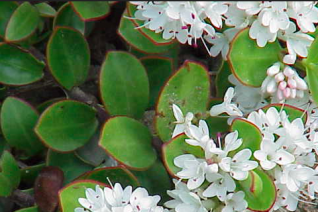 To 4″ tall- foliage prostrate and spreading to 18″ wide in several seasons. Great in rock gardens. Cold hardy, drought adapted and easy small scale plant. 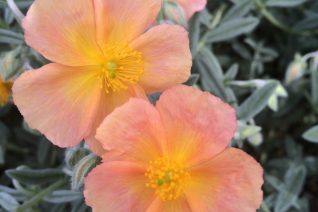 For several reasons this is a fantastic Helianthemum (Sunrose). Felted green/gray foliage is handsome as a backdrop to the masses of fully double pink flowers that appear for weeks. The single forms of Sunrose have flowers that last just one day but this double flowered form has flowers that individually last for days. 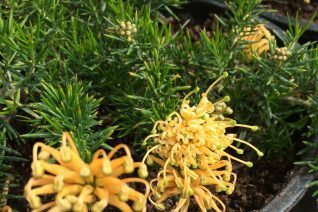 It significantly lengthens the bloom time on this charming low plant. Blooms appear from mid May to July. 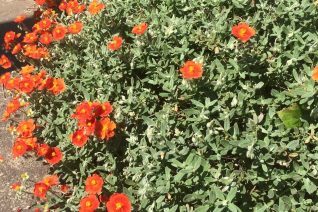 To 10″ tall and spreading to an area 2′ x 2′ in several years. Full sun and well drained soil of rich fertility. 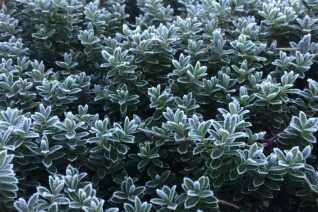 Beautiful small scale groundcover for banks, drier borders, rock gardens. Its best to cut Helianthemums back hard when blooming has ended. 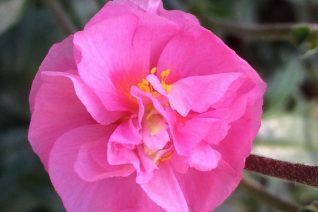 Remove the blooming stems and part of the current seasons growth. In return you achieve a dense compact plant that will yield more flowers the following year. For pink-o-philes this is a must have plant and one of our favorites at Xera. Light summer water. Some deer resistance. 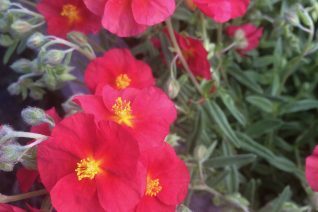 Fantastic low growing gray leaved evergreen Sunrose for sunny slopes. Gray foliage is a great backdrop to the masses of brilliant deep orange flowers that obscure the foliage for weeks in April/May. To 6″ tall and several feet wide in just a few years. Light, consistent summer water in rich, well drained soil in full sun. Cut back hard after flowering to ensure a more compact, tidy plant. Blooms simultaneously as Spanish lavender (Lavandula steochas for a wonderful purple and orange blast of color. 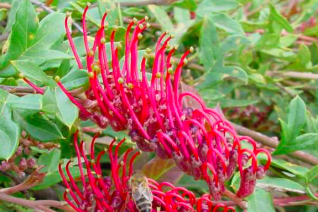 This little gray leaved evergreen shrublet becomes a fire of true red flowers for 4-6 weeks in mid to late spring. 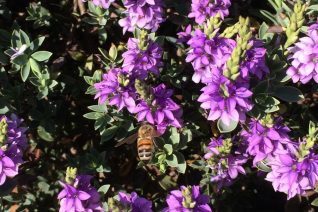 To 10″ tall and spreading to several feed wide in rich, well drained soil with light but consistent summer water. Better in soil that has been enriched with a bit of compost and light organic fertilizer. Each flower lasts just one day but they come in such profusion that the display is continuous for weeks. Excellent slope cover- rooting where stems touch the ground- ideal erosion control. Cut back hard after flowering has ended. Cut approximately 1/3 of the plant away and new fresh foliage will emerge creating a solid mound of foliage. Very brilliant Sunrose that we love.